Interesting story behind this one. It all starts with a man named Ray Palmer. Palmer was the sort of character who could have stepped out of a movie screen, or perhaps one of Burroughs' pulp adventures. Not Tarzan, not John Carter, nothing like that. Instead, he was one of the local bits of colour, perhaps a rascally but loveable villain, a comic relief character. He was just too over the top to be quite real. According to the stories, he was struck by a truck when seven years old. The accident left him with a broken spine, but somehow, he survived and persevered, growing up into a strange deformed hunchback around four feet tall. In pictures, he’s got a kind of overdone 'gee whiz' Eddie Haskell boy next door quality. He was born in 1910, just a few years before Burroughs published A Princess of Mars. He grew up as one of the original fans of science fiction, a member of 'first fandom,' escaping his life of pain and misery through pulp adventures. He created perhaps the first fanzine ever, the Comet, in 1930, and in 1938 became the editor of Amazing stories. From this platform, he became one of the most influential editors of the pulp era, defining the brand of science fiction as a form of swashbuckling derring do, until the more rigourous Campbell era. This, of course, would have been enough to have earned him a reasonable, if small chapter in the history of science fiction. But here’s where Palmer went completely over the bend. 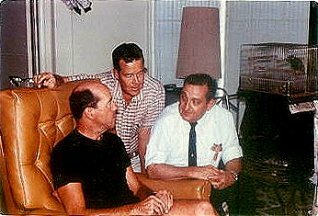 The Shaver mystery itself is a fascinating story. Shaver was almost certainly a classic schizophrenic. But his delusions found an eager and rapt audience, who watched with awe and incredulity as his belief structure unfolded. Indeed, the Shaver story is almost one of a proto-religion, something that tells us a lot of the structure of belief. Palmer was also a key figure in the Flying Saucer craze of the 1950s. In 1948, he started a magazine called Fate, which focused on the paranormal. But with the sightings of flying disks, and interest in them, Palmer’s focus shifted. 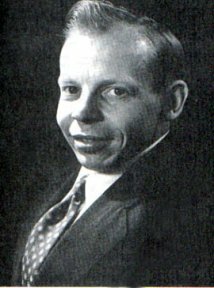 He published some of the first reports of flying saucers, popularized many more, and helped to promote many of the key ideas - the benign Nordics and the contactee phenomenon, the men in black, the whole thing. Palmer was a character who had literally stepped out of the pages of the pulps. But in a very real way, he lived in a pulp world. For Ray Palmer, the brilliant hunchback, the world simply wasn’t the mundane place we lived in. It was rather, filled with flying saucers, underground civilizations and mysteries every where we turned. The fantastic adventures reflected in his pulp magazines, seemed to be all around him in the real world. Hell, any day now, one of those saucers would land and Martians would come out, or the earth would belch out an army of conquering Teros. Any day now. This is where he lived. Or did he believe it? Ray Palmer wrote the stuff, and he published and edited it. He certainly knew fantasy and science fiction when he saw it. It was his stock in trade. Did he really buy into the Shaver Mystery, Flying Saucers and the paranormal. I think yes and no. Given the tenor of the time, it was the sort of stuff that struck where he lived, it interested, even fascinated him. If it didn’t interest him, he would have probably gone on and done something else. On the other hand, he was a as a publisher and an editor, a natural showman. His deformity kept him behind the curtain, he’d never be a front row hustler like P.T. Barnum. But in his world of magazines and print, he wasn’t a hunchback, he was a giant. He was a hustler, a showman, a con man, a carnival barker. He was out there to sell magazines, particularly when he broke away from Ziff Davis and started his own magazines, and he knew all the tricks to selling lots and selling big. It was all about finding the wave, catching it and riding it for all it was worth. One writer who notably did not contribute was Edgar Rice Burroughs, who had died in 1950. It was a shame, the new age of science fiction under John W. Campbell had no room for Burroughs stories, but it was Palmer's bread and butter. I’m sure he’d have published Burroughs in a heartbeat. 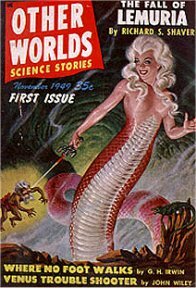 Along came Stuart J. Byrne, a now obscure pulp writer who’d had a history with Palmer. Byrne, writing under the name John Bloodstone (ack!!!) wrote Tarzan on Mars. The story, as nearly as I can gather from sources on the net is that La leaves Opar, looking for a mate (Tarzan). Then La and Jane vanish from the Earth during World War II. Tarzan searches and eventually learns that they’re on Mars. He persuades Jason Gridley to build him a rocketship to get out there. 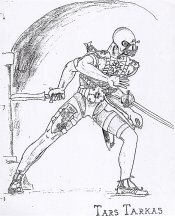 Arriving on Mars, he has various adventures, encountering John Carter, Carthoris and much of the Barsoomian cast. 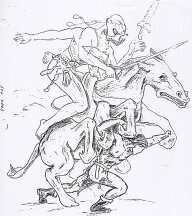 Eventually, it is discovered that La is the long lost incarnation of the Goddess Issus, and her true love is Kar Komak, the phantom bowman from Thuvia (something Byrne acknowledges was borrowed from H. Rider Haggard's She). But the very idea was a masterstroke. A new Tarzan novel! A new Mars novel! 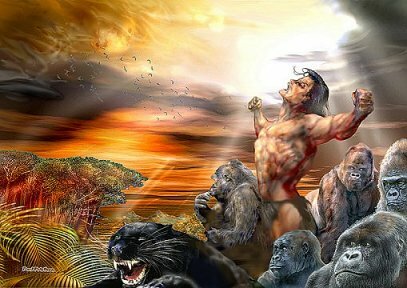 The only thing more stunning and exciting was to combine them into a new Tarzan novel set on Mars!!! You could just imagine the ripples of fascination and excitement that tore through the fan communities that nestled around Palmer's magazine. Palmer certainly could. This was a guy who sold his magazines by selling wild stories and wilder ideas. This was another wild horse to ride to sales and profit. Of course, there was a problem. 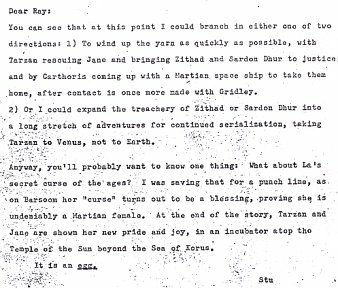 Tarzan on Mars couldn't be published, since the Burroughs estate held all the rights, and they weren’t really interested in franchising out the product. It may have been conservatism, it may have been that they felt the real money was in Hollywood, or it may simply have been that they just thought Ray Palmer was a creepy hustler. Bottom line, Palmer needed to get the rights from the Burroughs estate, and they said, nothing doing. Imagine being Ray Palmer, four foot tall hunchback, in a crowded office surrounded by all sorts of crazy four-colour artwork, stories, invoices, pieces of paper sticking out all over, touching on everything from the latest flying saucer sighting, to a letter claiming to be an underground civilization, to a sheaf of stories ranging the gamut from earnest twelve-year-olds to the top names in the business. He’s sitting there with a manuscript, Tarzan on Mars, that promises to be a literal gold mine. Imagine the copies he can sell, imagine the artwork he’ll commission, imagine the storm he’ll create. . . The master revived, a new Burroughs, the classic adventures given new life. . . That would put him on the map, it would show everyone. It would be an ultimate coup. And there’s a letter from the Burroughs estate telling him to get stuffed. 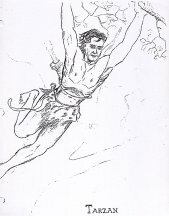 Tarzan on Mars will never be published. From the heights to the depths. Palmer’s flights of Icarus fancy, dashed on the cold realities of stormy rocks of mundane reality. I dunno, get drunk or something, curse the fates, egg Hulbert Burroughs' house. Palmer was far too gifted a showman to give up so easily. If he couldn’t use the actual story to sell magazines, he could use the story about the story. Suddenly, the narrative changed. Now it was the novel you’d never see. 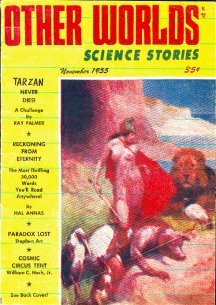 The amazing, the staggering, the sensational Tarzan on Mars, kept from publication. The tragedy. Ah, but tragedy alone doesn’t sell magazines. You need hope, conflict, you need purpose and action! 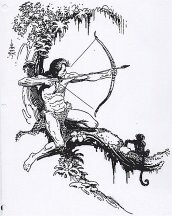 So Palmer came up with a fan campaign to not only get Tarzan on Mars approved by the Burroughs estate, he raised the stakes, and campaigned to get ‘John Bloodstone’ named as Burroughs literary heir, the guy who’d continue writing the Burroughs legacy. 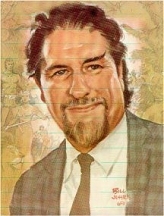 “Tarzan Never Dies,” Palmer would write in an article for his magazine in 1955. It probably worked. People heard about it, fans debated and argued, they wrote letters, Palmer sold magazines. Indeed, it probably worked out better for him. He never actually had to pay for Tarzan on Mars. Had he published, it would have been a nine day wonder. And if it wasn’t any good, it could well blow up in everyone’s face. But as the great unpublished adventure, he could tout it endlessly, talking it up. He never had to produce, no one was ever disappointed, the hype need never die down. He’d just keep riding it until some other craze came along to sell magazines for him. And it didn’t cost him a nickle. Tarzan on Mars became a minor fan legend. And from there, it accumulated an almost Maltese Falconesque history. Two copies of the book were printed and bound by Byrne. One went to Raymond Palmer, the other to legendary Burroughs fan Stan Vinson. Interestingly, it appears that Byrne had his own bound copy, so it may have been a third, or his copy might be a return from Palmer or Vinson. 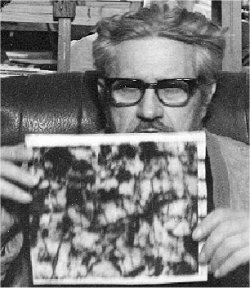 According to Michael Resnick, Vinson used the primitive mimeography of the day to publish a ‘limited second edition’ of ten copies of the book, sometime in the 1950s. One of these ten wound up in the hands of another fan, Tim Conrad, who printed a third edition of 25 copies. It's likely that over the last forty years, there’ve been other ‘one off’ editions, single photocopies, limited print runs, dog eared bits passes from fan to fan. It’s the sort of treasure one might find at a convention. Or for that matter, on eBay or the net, at prices ranging from $800 to $49.95. Of course, memories fade, even the wildest scandals evaporate away. This all took place before I was even born, and perhaps two or even three generations of fans have come along since then. Modern fans can quote the lines from Chad Vader, but seeing a dog-eared copy of Tarzan on Mars in a dealers room probably brings no more than a furrowing of the brow, or a mild curiousity divorced from the colourful history behind it. According to some reports, bits of Tarzan on Mars were incorporated into “Tarzan the Epic Adventures” TV series. That has to be taken with a grain of salt. “Tarzan, the Epic Adventures” was one of those Hercules/Xena clones that came about from when CGI prices dropped. 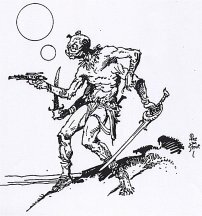 It ran one season, which featured Mahars from Pellucidar and gentlemen from Amtor, but there were no trips to or visits from Barsoom. On the other hand, Barsoom was incorporated into the ‘Tarzan’ toy line, which perhaps suggests that something was being planned for the second season, that never came about. However, my thinking is that if “Tarzan, the Epic Adventures” was going that way, it was probably more coincidence than Byrne. 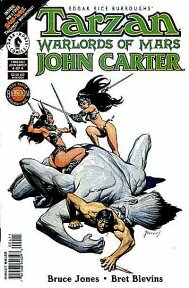 More nakedly, Dark Horse published a comic book limited series called ‘Tarzan and John Carter: Warlords of Mars.’ This is likely an independent work, not derived from, and with only coincidental similarities, if any, to Byrne’s work. 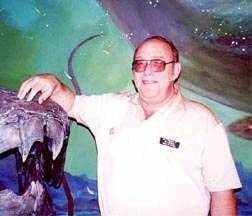 Other fans tried their hand, including Mike Resnick with his teenage version of Forgotten sea of Mars, and another fan fic called “Tarzan at Mars Core.” Possibly some, as with Resnick, were inspired by the idea of Bloodstone’s novel. Others may have riffed directly. Still others probably came up with the idea all by themselves, it’s a fairly short leap to crossover Burroughs two most famous franchises. But that still leaves the question on Tarzan on Mars: Is it any good? 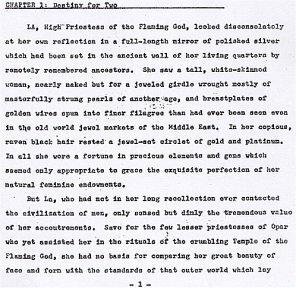 Whether this prose reflects his fiction writing style, I have no idea. Even if it did, some people like purple, or even ultraviolet. I’ve heard different opinions on it. As to whether it’s a worthy contribution, I’ll reserve my opinion until I end up reading it, if ever. Sometimes its enough that something like that is out there. Contains stories by top writers such as Mercedes Lackey, Sarah Hoyt, and Mike Resnick.